"Use of the transformation class requires a knowledge of geometrical transformations in 3 dimensions which is covered extensively on the Internet." That's what the Google doc says. I found that statement totally unacceptable. Fortunately, as Chapter 15 demonstrates, you can make effective use of the Transformation class without the "required" knowledge. I was going to introduce this material in Chapter 15, but it was really not needed. So I stuck it back here in the appendices for those who never stop asking, "Why?" 3d computer graphics is built on, among other things, a four-by-four array of real numbers known as the transformation matrix. 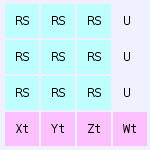 By plugging appropriate values into this matrix you can move, rotate and scale geometry. OpenGL, the graphics language specified by OpenGL.org (according to itself, "The Industry's Foundation for High Performance Graphics") understands the transformation matrix. Your graphics card understands OpenGL. The number one is the identity value in scalar multiplication. One times X equals X. If we call the identity matrix I and another matrix M, I * M = M. We'll have an example of this shortly. Now let's rotate. Create a transformation matrix that specifies a rotation. (For the moment, assume this is possible. Details are coming.) Multiply this rotating matrix by the geometry's transformation matrix. The result replaces the geometry's transformation matrix. Now when you multiply each vertex by the new matrix, the result is the vertex's location after applying the rotation. Now let's scale. It's the same as rotating. A matrix that specifies the desired scaling is multiplied by the existing matrix to get a new matrix that specifies the previous rotating plus the new scaling. Assume your geometry has a hundred vertices. We just did one hundred matrix multiplications to rotate it; another hundred to scale it. Dumb. Let's get smart. Take the matrix that specifies rotation. Multiply it by the matrix that specifies scaling. The result matrix specifies both rotation and scaling. Multiply the result by each vertex to locate the vertices in space. That's a hundred and one matrix multiplications. Smart. Do you want to rotate around three axes and scale by different amounts in two axes? That would be 105 multiplcations if you do it the smart way, 500 multiplications if you're not smart. This matters. Now, how do you multiply a vertex (original location) by a matrix that specifies transformations? We'll begin with the Rotation/Scale matrix. How do you multiply a 3d vertex by a 3d matrix and get another vertex? Let's multiply a vertex by the identity matrix, just to check. There are similar matrices for rotations around the other axes, which you can look up at Ruth's Ruthless Homepage. If you multiply two rotation matrices you get a combination that performs both rotations at once. Multiplying one scaling matrix by another scaling matrix combines to give both operations. Multiplying a rotating matrix by a scaling matrix combines the operations. Adding a vector to a vertex translates the result, an operation @Last wisely labeled "Move." Where to put a translation? Enter the 4x4 transformation matrix. So far we've looked exclusively at its first three rows and columns. Now we expand. In the last row, add a "homogeneous coordinate", [x,y,z],w. This is trickier to pronounce than to understand. Begin with [0,0,0],1. This specifies no translation. The fourth value is a divisor for the others, so [4,6,8],2 is another way of saying [2,3,4],1. The translation vector's origin point is unspecified. SketchUp's translation is always relative to the [0,0,0] origin. To translate you add the translation (after dividing by w if w is not 1) to the rotated and scaled point. For more detail on the homogeneous coordinate, see this Google knol. Do not attempt to code from this summary. It succeeds if it gives you a good idea of what is going on under the covers. It fails if you think you don't need a real 3d textbook to do 3d programming. See the comments to the above-mentioned knol to witness real experts arguing small but critical points. Microsoft's DirectX is, as always, different from the industry standard. Is there a hand raised in back? "Speak up." The question is, "How do you multiply matrices?" It's like multiplying a vertex by an array, only messier. Stefan Waner at Hofstra explains the process very well. 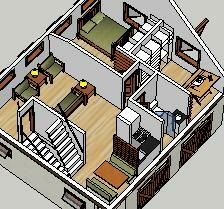 After I learned it from him I thought, "The SketchUp engineers programmed this years back. I should have just believed them." P.S. I should have just believed them except for the fatal bug in ComponentInstance.move!(). To get around the bug, for Chapter 16's work, I had to program a matrix class that knew how to multiply. Thank you, Stefan Waner. That is now explained here, with lots of colored blocks, in Appendix MM.